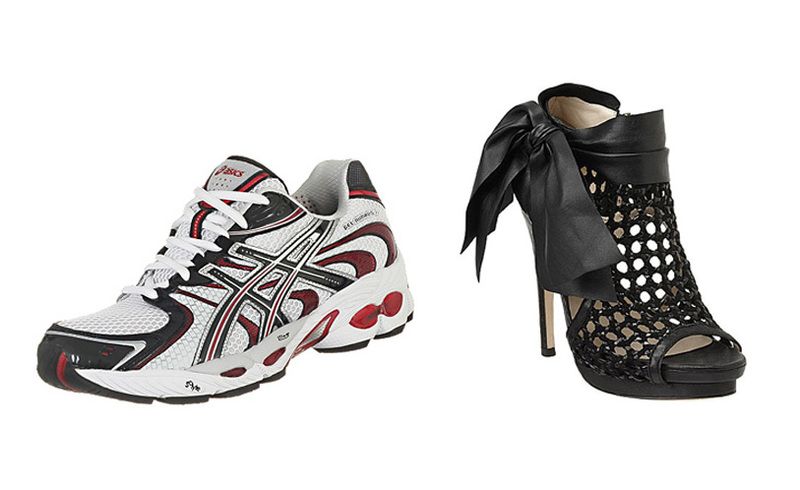 i married a runner: the shopper's choice of shoes. I really love shoes. I own possibly more than 20 pairs. Out of all of them, only one can be considered an actual sports training shoe. It's the one I bought almost 5 years ago, when I actually attempted to be a regular at gyming (I failed). Being someone who did not develop any motivation to actually participate in strenuous activities, my appreciation for such footwear likewise remained at zero. Because simply, given the money to splurge, I'd rather place my high arch (so those running simulation tests tell me) on a pair that would add oomph to my outfit, and strut to my walk. They basically would cost the same anyway. Like, come on... look at that. Webby-meshy net of a design strewn across your foot? Would rather have it on a cage leather bootie. And look, they both have bows too (people would probably kill me for calling running shoe laces a bow). The hubby has been constantly prodding me to actually get a pair. And he's actually volunteering to pay for it. I'm hesitant. I honestly feel that my other shoes would feel bad. My heels, I mean. But then again, it may be the only time he'll actually buy me shoes. Now that, could get me thinking.